Betty Anne Gagnon and her friend and former roommate Suzanne Jackett. 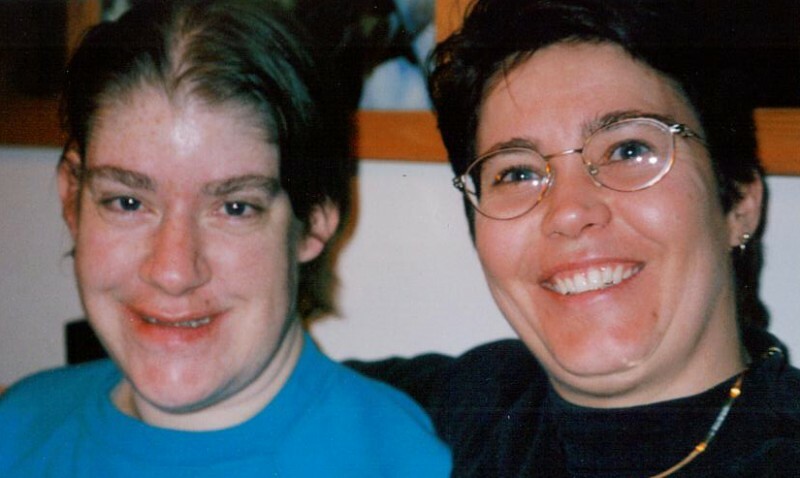 Betty Anne Gagnon was a woman with an intellectual and a visual impairment who died on November 20, 2009, at age 48, while under the care of her sister and brother-in-law. The two were charged and will be sentenced on April 19, 2013. Heather O’Bray ,Suzanne Jackett and Sue Thomas were three supportive roommates for Betty Anne. They explained that Betty Anne was able to live somewhat independently in her own suite, with daily assistance from them. Together they lived with her for 18 years. On their website in support of justice for Betty Anne, her roommates describe her as a woman who loved her circle of family and friends. They say she read the two local papers from front to back – cutting out her dreams of poodles, trips to Paris and motorhomes for sale. She also read celebrity magazines (like Teen Beat) and especially liked Ty Pennington, Jonathan Taylor Thomas and Michael Landon. They said she was always excited to meet and snuggle with a new puppy. On Saturdays she enjoyed bowling and window shopping at the mall. She worked and volunteered at a number of places in Calgary, including Joeys Fish & Chips, Auto Stop Car Wash and the Native Women’s Emergency Shelter. Her friends remember that Betty Anne’s favourite home-cooked meal was Kraft Dinner, but for eating out, she chose Fettucine Alfredo from the Cheesecake Cafe. As she loved whales and dolphins, her favourite movie was Free Willy. These three women who lived with and supported Betty Anne said that if they knew the fate that awaited her, they never would have let her go. For more details, or to support Betty Anne Gagnon and demand justice for her, click here: Justice for Betty Anne Gagnon (available in English only).